The last couple of weeks or so have been peculiar for me as well as for others here in Lipa because we have been seeing so many planes flying around the city in formation. After all these years, I have still not lost my fascination for planes. So, I still peek out the window when they pass just to the west of the house right after take-off. Where I live is practically in line with the runway inside Fernando Air Base. Hence, the planes are still quite low when they pass by. Sometimes, they pass right over my roof. The noise is a bit annoying especially when I am watching something on television; but no more than that. I grew up in the Air Force, after all. Whatever noises the planes make, they are still nothing compared to the earthshaking roars that the old T-28 and T-34 trainer planes could make in the old days. Suffice it to say that the volume of planes adorning the skies of Lipa City is not normal – at least not for recent years. Out of curiosity if nothing else, I sent a text message to a former student who is now in the Air Force. No, we are not preparing for a Chinese invasion. 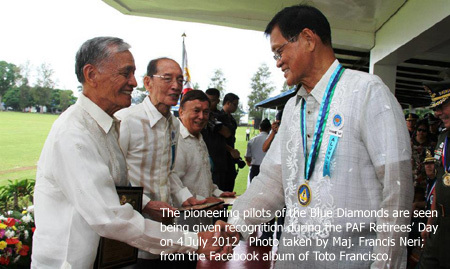 It was Air Force Retirees’ Day yesterday the fourth and PAF Day tomorrow the sixth, I was told. The planes had been practising formations for flybys. 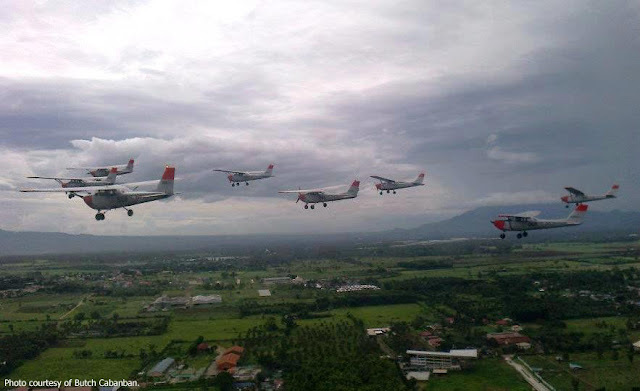 I think that it is a good thing for people to see these formation flights. It shows them that the Air Force has planes, after all. Because it has been a while since we had been seeing these, there is good educational and entertainment value for the young. You just never know which of the young boys and girls looking up at the skies in fascination will one day want to fly for the Air Force. I used to see a lot of these formations in the old days, of course. As a little boy, I derived so much pleasure looking up whenever these formations flew by. I never grew tired of watching even if these were part and parcel of daily life in an Air Force base. 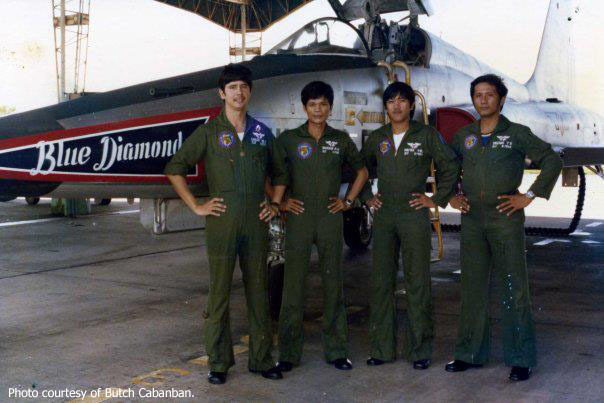 The greatest fascination, however, I reserved for an elite squadron of F-5 fighter jets called the Blue Diamonds. On the rare occasions that the squadron was in town, everyone in the family – including my Mom – went out of the house to watch. In the eyes of the little boy that I still was, simply stated, the Blue Diamonds were the greatest show in the world. Now the F-5 Freedom Fighter, even by itself, was already a sight to behold. To this day, I still think that the F-5 is the most aesthetically perfect fighter aircraft ever built. Manufactured by Northrop Corporation of the United States, the F-5 had a simple yet elegant shape, the most distinctive feature of which was its slim pointed nose and small swept wings. The F-5 flew at supersonic speed; and as a little boy, I had mastered the art of looking ahead of where the sound came from to actually catch a glimpse of the jetfighter glistening under the sun. Now a squadron of these fighters flying in formation, that was a sight to behold! In a way, I feel sorry for the younger generations who have not been able to witness the sorts of treats that I used to take so for granted when I was a little boy. Although the last of the Air Force’s F-5’s was decommissioned as recently as 2005, the F-5 was seldom in the skies long before that year, anyway. When the Blue Diamonds came to visit, now that was the greatest treat of all! The squadron was an aerobatics team. To those not familiar with the term aerobatics, it refers to planes performing manoeuvres not associated with normal flight. In short, it means planes performing acrobatics. The squadron was established as far back as 1953 and flew with WWII vintage P-51 Mustangs. The group was initially named ‘Blue Diamond’ and later used Korean War-vintage F-86 Sabre fighters after the Mustangs were retired. The name Blue Diamonds – with an ‘s’ – was formalized in 1960. 1964 was the last year when the squadron flew with the Sabres. I must have seen these as well because I was five years old already at the time; but my vivid memories are of performances by the squadron using the F-5 Freedom Fighters. The squadron started using these in 1968. I can still vividly recall holding my breath when the jets flew just above treetop level past the runway of the Base; inverted, by the way. Or two jets flying one on top of the other, how awesome was that! Or for two jets to appear to be flying towards each other as if for a head-on collision only to miss the other by what seemed to be no more than a few feet! The jets also flew with smoke generators; and with the smoke that they left behind they could weave figures. A jet would fly in a loop and create a perfect circle of smoke. Even though we were on the ground far from where the pilots flew, when the manoeuvres were completed we could not help but applaud. My favourite of all the manoeuvres – and I am getting goose bumps even just writing this – was one that was called the ‘bomb burst.’ Four to six aircraft would fly towards each other at the same height from opposite directions and at the right moment turn their noses up into the skies to then loop back downwards. The smoke trails left behind looked not unlike that of a nuclear explosion. I do not believe that there are even words that can accurately describe how beautiful it was. Although we watched from inside the Base, the manoeuvres were visible from miles away and must have been viewed as well by thousands others. That is why I feel sorry for younger generations who never got the chance to see the Blue Diamonds performing; and I write this with the hope that even with words, I could bring to others one of the joys of my youth. I hear from the news that the country is acquiring new fighter aircraft. That is good news! 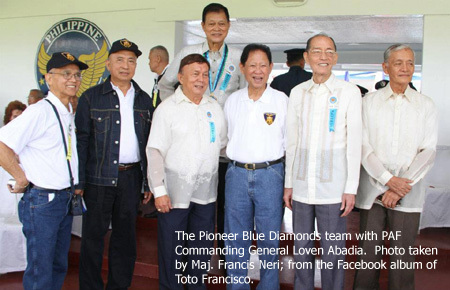 Not because of the squabble with China, but because when they come there will be a chance again for the Blue Diamonds to be revived so that young boys of the present generation may have reason to stare up at the skies with eyes shining in wonder at the awesome things that jet fighters can do.